If you missed the Shoe-Inn Sample Sale at Gotham Hall, don't worry - the sale continues on at Manhattan Center Hammerstein Ballroom on January 18th, 19th and 20th! During my lunch I headed over to Gotham Hall for the last day of the sale. For joining the mailing list, you received $5 off, in addition to 20% off shoes, 10% off boots and 10% off accessories. 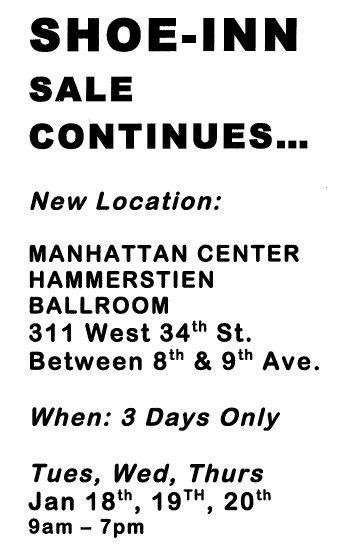 Last year, I noted that the Hammerstein Ballroom Shoe-Inn started off at lower price points so I am anticipating that this time around as well. The Roberto Del Carlo boots I saw today for$199 were the exact same pair I bought at Hammerstein Ballroom for $99 last January. Same with the Paola Ferri boots I saw today for $129.99 that I got 2 years ago, for I think $55. There were tons of cute shoes I loved - including Gastone Lucioli and Stuart Weitzman, but none in my size. There were actually no shoes in my size (5). The had some boots in size 5, but no shoes. I managed to snag a pair of Micheal Kors High Heel Sandals for $35! I really wanted these in black. Maybe I'll find them at the upcoming Shoe-Inn! Also just a few tips: If you are looking for kids Uggs, go the very first day while they are still stocked! The Uggs do not get marked down so get them early! Shoppers are brutal! Hold onto your shoes and prepare for a lot of pushing and shoving!